Going over the basics into how to start this achievement. 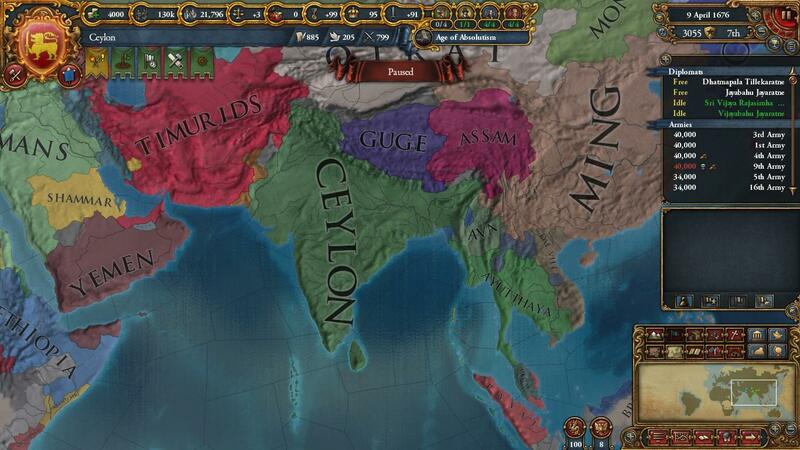 As Ceylon, own all of India and convert it to Theravada Buddhism (do not form another nation). As you can see you start of as a 2 provence minor in India with your neighbours all hostile to you. 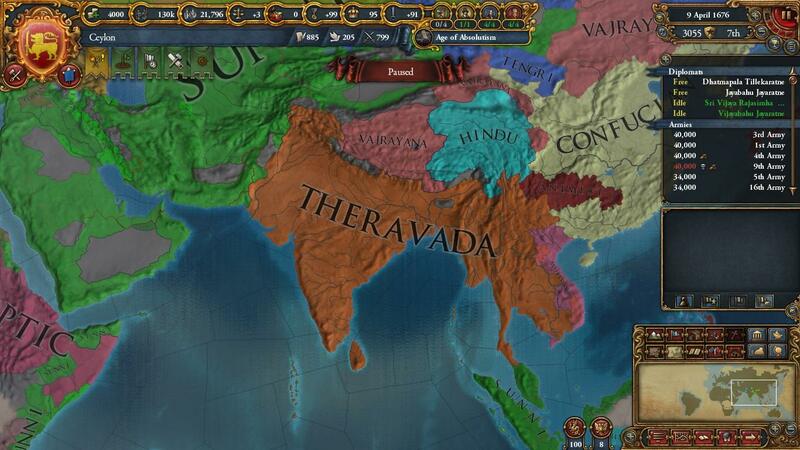 You are the only Therevada nation in the region and you have a angry and hungry Vijayanagar wanting your land ASAP. The begining of the game you it will be up to how Vijayanagar does and attacking them with Bahmanis as your ally early on doesn't tend to work anymore due to there recent updates a few patchs ago. 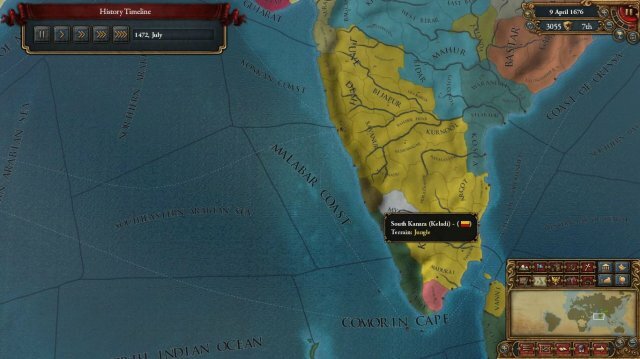 Your ruler is decent but your heir is worse but you should make both generals to try and increase the chance of them dying, also make sure you focus on Admin points (you will need them all throughout the game and you will be needing alot to core alot of lands as alot of India is exspensive throughout the game. Your first target is the Maldives. Why: Maldives are a island nation that no one will care about and will also give you help with your nation cause after you core the provence you will be able to culture convert your capital therefore you will be able to culture convert when the capital is culturally converted you should then convert your other provence to your new cultural which will help you in your expansion into the southern tip of India. Your next steps are to try and exploit the tamil and southern nations i got Korchin as the nation to invade while a diffrent nation may be your target (if none of them are alive which is usually unlikely you should probably reset unless you feel compitent enough to take on the much larger Vijayanagar which will stomp any nation that neighbours it early on. 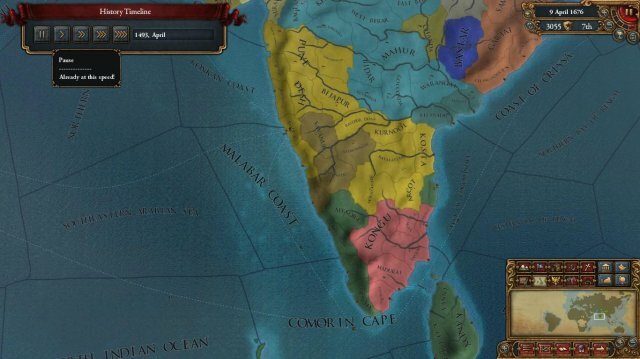 After you have gotten a provence in the south of India you can now expand to the rest of the small nations there to get a larger base. 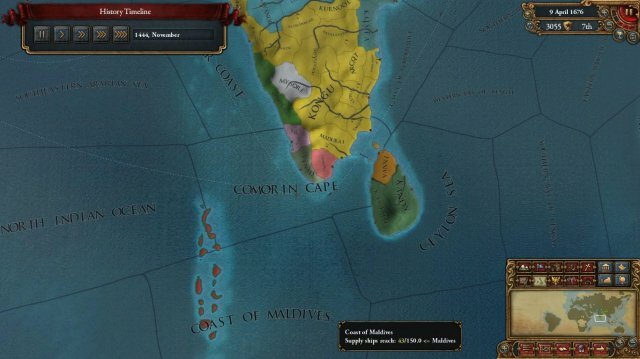 You may want to release Madarai and Keladai as your vassals to save some admin points early on. At this point it should be about time to get your 1st Idea choose Religious Ideas and get to Deus Vault ASAP giving you free CB expansions to all of India and also easier to convert India which has a few religious centers. Your nation should look like this. When you feel ready invade Vijayanagar and GL. 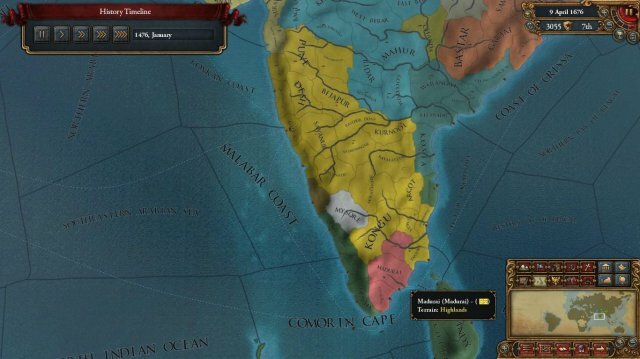 I allied Bahmanis and Orissa for this and as usuall Vijayanagar will only have at most Mysore and Andahara as allies which should be easy to take out before dealing with Vijayanagar and don't think it's over if they take your capital as you will still win if you have managed to not get your army demolished (which is pretty easy when the AI wants to take your capital before your army). I didn't manage to take much in the first war but i expanded one of my vassals which still weakend Vijayanagar. After the first war Vijayanagar will most likely start crumbling with rebellions which will make the second war with them much easier and other nations will start to carve up the remains of there nation. Now that Vijayanagar is dealt with you will become more of a powerhouse so you should deal with your next enemies who will be your once ally of Bahmanis and maybe also Orrisa if they were also your ally. You should always ally with the rivals so they can take the damage for you while you sit back and attack when you can and slowly carve up the northern nations. Your second idea group can be anything i choose Defensive because i always like that idea group but you should pick for your 3rd unless your able to make it your second idea as Administrative as it will help out with the coring of India. Your hardest nations to fight after Bahmanis is pretty much gone will be the 2 big nations to the North Dheli and Janapur at this point you should be able to ally with strong enough people to stop coalitons forming and to take out the northern nations. Once you have most of India you should probably have one or two nations left who (if you have mandate of Heaven) will be tributarys of Ming as Ming rarely dies in the modern patchs and by the time you get to being big enough to attack there tributarys Ming will tend to have 400k troops which is easy to deal with even with half the number as they will stack up to a usual of 70/80k stacks so they become war exausted quickly therefore a easy way to kick them out if you didn't want to expand further than just the India like i did. Once the last country is dealt with you should just be able to sit back and wait for the cores and conversions to take place you should have all 150 Indian provences by this point. 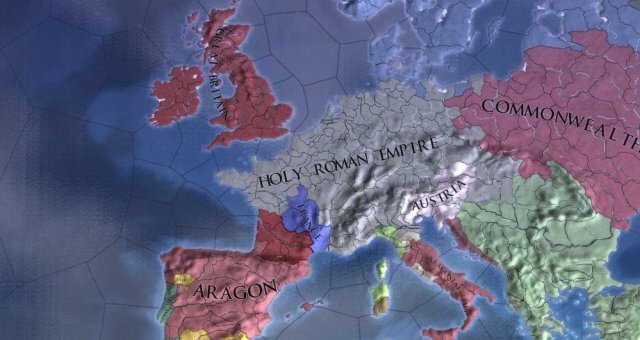 This is what your nation should look like if you only took the provences in the Region. 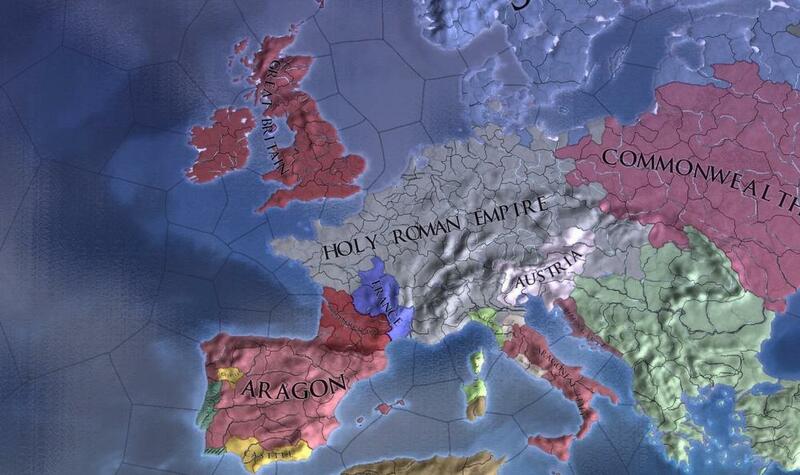 And this will probably be what your relgious map mode may look like. So in the end the begining is just about luck and once you have defeated the 1st major obsticle you should be able to blob with ease.